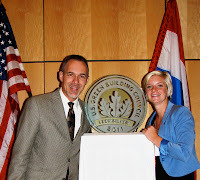 I am pleased to report that my work with the Royal Netherlands Embassy in Washington, DC has resulted in their achieving LEED Silver for their building. They were awarded Silver for the Existing Buildings: Operations and Management (EBOM) track. (I am a LEED AP and am available to help others pursue similar goals.) The building was constructed in the 1950's and underwent pretty significant improvements in the early 90's. The project started in the spring of 2010 and was completed in June of 2011. Preliminary review by the Green Building Certification Institute (the official certifying body) was followed by a re-submittal of additional documentation in September. This re-submittal resulted in 49 points, just one shy of Silver. We were able to successfully appeal one credit to achieve the necessary 50 points. The Embassy hired a Dutch firm named Corporate Facility Partners (CFP), which managed the overall project--primarily in regards to energy performance and mechanical operations. My role was to navigate the LEED process and assist the team with whatever other needs were necessary to meet the goal. LEED EBOM is significantly different than the other LEED certifications that primarily focus on construction. EBOM focuses on the performance of the building itself as well as the management of environmental issues within the building. In general, one can think of EBOM as a method of looking at and tracking everything that comes into and goes out of the building: electricity, gas, chemicals, office supplies, waste, food, etc. If it comes into the building it is tracked; if it leaves the building it is tracked. The idea, then, is to reduce the environmental footprint associated with all of those things. EBOM requires re-certification at least every five years, and the building needs to continue tracking their performance throughout. Or else they would need to restart their certification from scratch. As a LEED AP, I provide services to building management to help understand, pursue and achieve LEED certification. I would be pleased to talk with any interested parties about LEED and its applicability to your project. Please feel free to contact me or pass along my information to others.